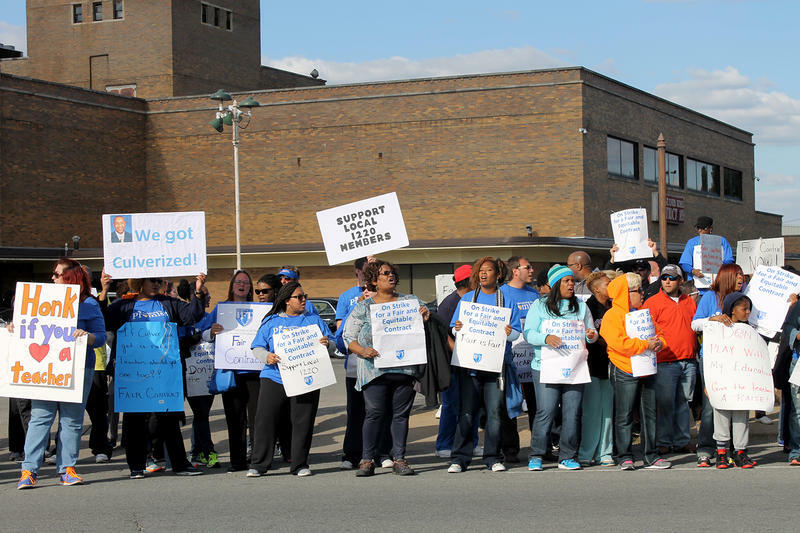 A crowd of teachers and supporters picket outside East St. Louis School District 189's administrative offices Thurs. Oct. 1, 2015. Updated Oct. 15, 3:04 p.m. -- Another negotiating session that lasted just one hour Thursday failed to reach an agreement to end the teachers strike in East St. Louis. The teachers union and the district have met several times with a federal mediator to try to end the walkout that has canceled classes since Oct. 1 for more than 6,000 students. The sticking point remains the salary schedule for teachers. The district wants to lengthen the time it takes for teachers to reach the top of the pay scale, to 21 years from the current 11 years. It says it can’t afford to keep the current schedule. But teachers say the proposal makes the time it takes to reach the top salary too long and the change amounts to a pay cut. Updated Oct. 15, 10 a.m. - The East St. Louis school district and teachers union have yet to reach an agreement, despite a mediation session that lasted roughly seven hours Wednesday. Union spokesperson Dave Comerford said in a statement that the teachers offered a plan that reduces costs by more than $4 million and are calling for an examination of the true cost of the salary schedule. The union is concerned about how long it would take for members to reach the top of the scale proposed by the district. 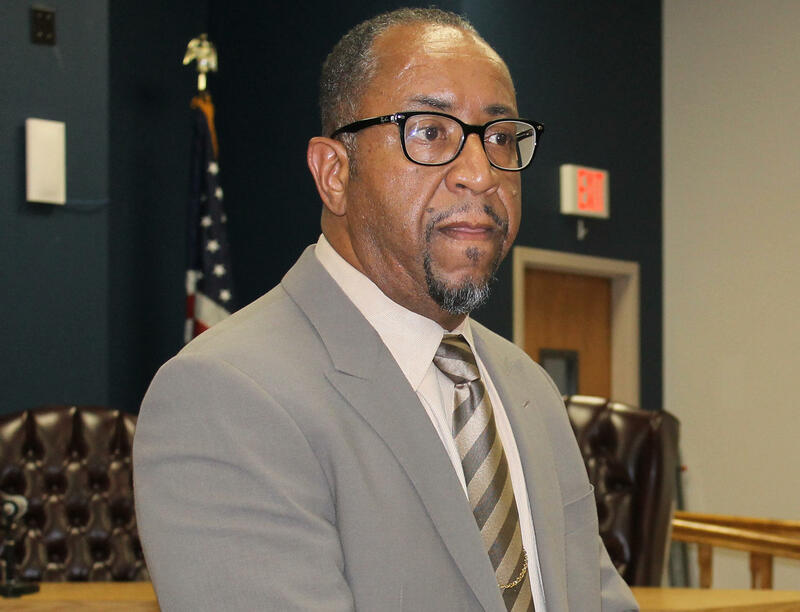 Superintendent Arthur Culver said there are still money concerns, adding he will not support a deal that "the district cannot financially sustain." More talks are set for Thursday. Updated Oct. 13, 4 p.m.-Striking teachers and the East St. Louis school district say they will resume negotiations on Wednesday.Teachers walked off the job on October 1 after rejecting a salary schedule proposed by the district. 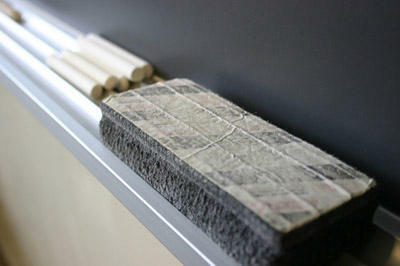 The union says teachers would have to wait too long to reach the top of the salary scale under the proposed schedule. But the district says it can't afford to make the schedule any shorter. Earlier sessions with a federal mediator failed to result in an agreement. The last strike by East St. Louis teachers, in 1997, lasted 24 days. Though students remain out of class, the district's school board Tuesday held an emergency session and approved a resolution that would allow sports teams to practice during the walkout. Updated Oct. 5, 8:45 p.m. negotiations stall. There’s no end in sight for the teacher strike in East St. Louis. On Monday, representatives for both the district and teacher union met with a federal mediator, but those talks stalled. The major sticking point is how long it would take teachers to max out their pay. The union wants a schedule that, barring a salary freeze, would allow a new teacher to reach the top of the pay scale in 11 years. But Culver said that’s not sustainable and wants a scale the stretches out across 21 years. The district’s proposal would give teachers a $2,000 stipend and a raise that averages 2.6 percent per teacher. But Illinois Federation of Teachers spokesman Dave Comerford said moving to the longer schedule could drive new teachers away. 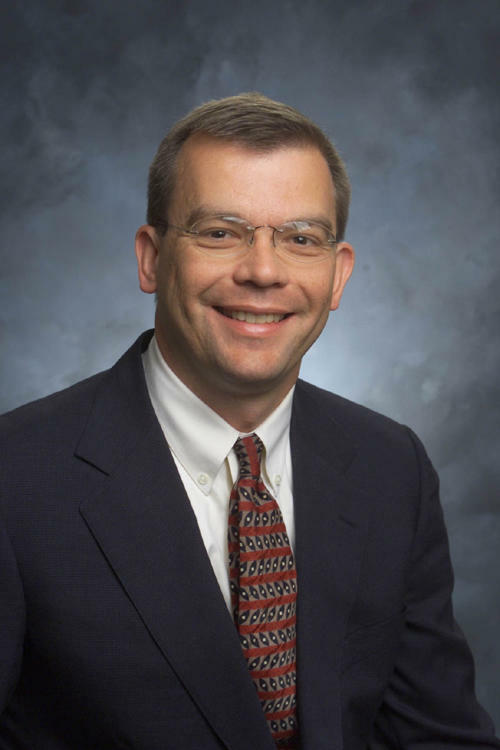 Union representatives say the school system could afford the 11-year schedule and Comerford pointed to what he said was more than $30 million in the district’s reserve fund. Culver said that money came from restructured debt, closing facilities, staff reductions and state money that he wasn’t sure would be there in the future. The money gives the district a roughly four month cushion in operating expenses, which Culver said is a fiscal best practice. As of Monday night, no further talks were scheduled. 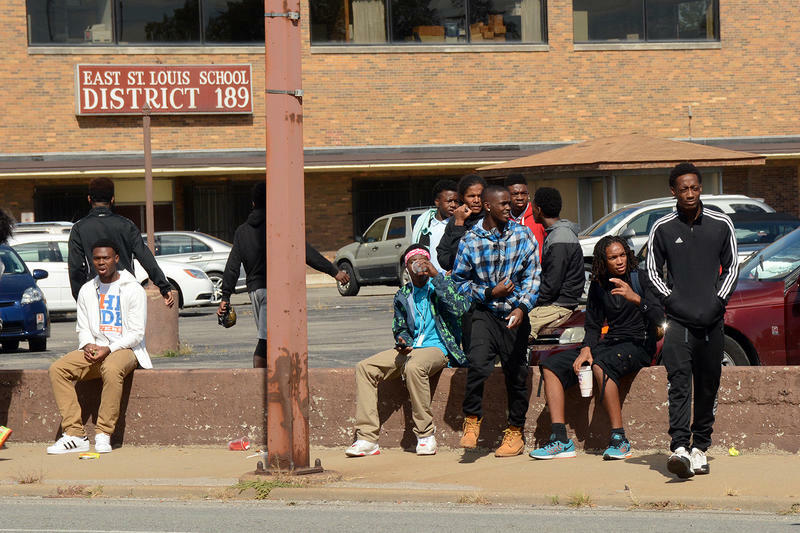 More than 6,000 students attend schools in the East St. Louis school district. “Updated 4:45 p.m. Oct. 2 with news from union- School administrators and union leaders in East St. Louis are making plans to renew contract negotiations after two days of teacher strikes in East St. Louis. Dave Comerford of the Illinois Federation of Teachers told St. Louis Public Radio a session with a federal mediator is scheduled for Monday. Comerferd said that means teachers will continue to strike at least through Monday. After difficulties lining up staff on Thursday, the East St. Louis school district bussed its first through 12 graders to school Friday for breakfast, before giving them sack lunches and taking them home. A spokeswoman for the district said Friday meals and transportation will also be provided to Kindergartners beginning on Monday. The school district also has compiled a list of community services offering meals and activities for students during the strike. All of the more than 6,000 students enrolled in East St. Louis schools qualify for free and reduced lunch. The local chapter of the teacher union has about 400 members. Updated 12:30 p.m. Oct. 2 with latest from district- The East St. Louis teacher strike continues Friday. Both the school district and the local teacher union chapter say they’re waiting on the other side to come to the bargaining table. As teachers picketed outside the district office Thursday afternoon, Superintendent Arthur Culver told reporters he wants the strike to end but he is waiting for the union to officially request a meeting with the mediator. “We are more than willing to have another discussion. But we don’t want to be the ones to initiate that because we don’t have anything else to offer. We don’t have a new proposal. We have offered our best. Our pockets are empty,” Culver said. Meanwhile, outside on the picket line local union president Sharon Crockett said she had already requested a meeting. At issue is a contract proposal offered by the district that the superintendent projects will save East St. Louis at least $10 million over the next 10 years. The local chapter of the Illinois Federation of Teachers rejected that proposal Tuesday because it doubles the number of years it takes to reach the top of the pay scale, from 11 years to 21. Culver said Thursday the increased length of time puts East St. Louis’ salary schedule in line with other area school districts. East St. Louis Superintendent Arthur Culver speaks to reporters Thursday, Oct. 1, 2015 about the district's response to the teacher strike. Back on the picket line, Illinois Federation of Teachers spokesman Dave Comerford said East St. Louis needs the shorter salary scale to recruit and hold onto teachers. According to Crockett, East St. Louis had 29 unfilled teacher positions at the beginning of the school year. She said the district already has a hard time recruiting teachers and she’s concerned the new contract will make it more difficult. On the first day of the strike the school district wasn’t able to provide meals to its more than 6,000 students. Culver said Thursday he now has the staff in place to bus students from first to twelfth grade to school Friday, feed them breakfast and send them home with sack lunches. District spokeswoman Kelli Hawkins said Friday that if the strike continues Monday the meal program will be extended to also include Kindergartners. All students in the school district qualify for free or reduced lunch. Become a news source in the Public Insight Network and share what you know: How's the East St. Louis teachers' strike affecting you? School is canceled Thursday for 6,000 students in East St. Louis as teachers walk the picket line. About 400 union teachers and staff members went on strike at 7 a.m.
East St. Louis School District 189 spokeswoman Kelli Hawkins said Wednesday the superintendent is hopeful teachers will meet Thursday and reconsider the district’s contract offer. The district’s 400 union teachers rejected it Tuesday before voting to go on strike. 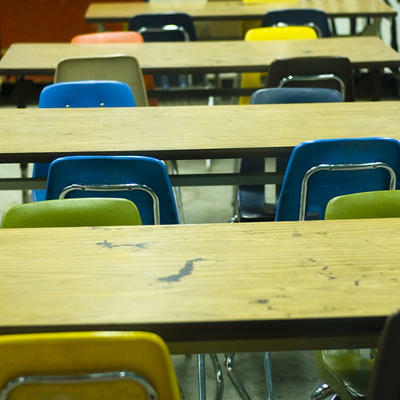 As summer break winds down, East St. Louis School District 189 is gearing up to begin spending $10.5 million in federal money to kick start academic performance at its two middle schools. In the coming days the district will begin the hiring process for 20 new positions to focus on everything from professional development to community engagement. The grant will also pay for an extended school schedule. The state's takeover of the district aims to improve student achievement, finances and governance, but progress will be hard without more money from Springfield. Christopher Koch knows what schools in East St. Louis need to succeed, and he has a pretty clear idea how to get the job done. He just hopes that the state of Illinois will provide the resources that the district needs. Illinois state education officials and members of the East St. Louis school board have settled a nearly year-old lawsuit sparked by the state board's attempt to take over the struggling district.